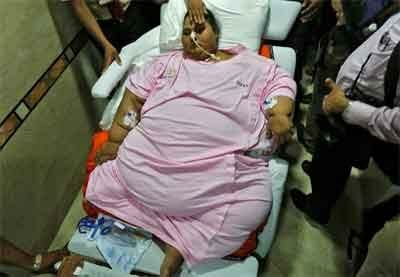 Dubai: Eman Ahmed, the Egyptian believed to have been the world’s heaviest woman, was admitted to a Abu Dhabi hospital to undergo long-term physical and psychological rehabilitation after a drastic weight-loss operation in India. Ahmed, 37, weighed about 500 kilogrammes when she went for surgery in Mumbai in February, but has shed an astonishing 323 kg since undergoing a series of medical procedures. With her weight now at 176.6kg, she will begin a year- long course of physiotherapy at VPS Burjeel Hospital in Abu Dhabi. Yassin El Shahat, the hospital’s chief medical officer, said Ahmed had a comfortable journey to Abu Dhabi. “I asked her personally how the journey was and she said she was very happy and it went very smooth,” said El Shahat. “Twenty doctors and specialists have been assigned to make a proper assessment and come up with a proper management plan, both short and long term,” said El Shahat. Sanet Meyer, director of medical evacuation at Burjeel, said the hospital “arranged for a hydraulic stretcher from Italy for Eman’s journey”. According to reports, the room in which she has been kept has a tailor-made toilet that can bear the patient’s weight. “She is confined to the bed now. But after considerable weight loss and when she becomes mobile, our intention is to train her to use the toilet,” CEO of Burjeel Hospital Raja Gujju was quoted as saying by the Khaleej Times. The hospital has also arranged a special ICU room for Ahmed with facilities for multi-disciplinary treatment. She will be admitted to the ICU first before she is moved to her room. “The idea is to complete the treatment the patient received in (Mumbai). We are going to assess the patient and see what has been done and complete it,” Shahat said. “We are working with a special dietician and diabetic dietician and will control her diet in a very strict way,” he said. She was flown to Mumbai on February 10 in a specialised logistical operation. On March 7, she underwent bariatric surgery at the city’s Saifee Hospital. She was put on a special liquid diet to reduce her weight enough so that doctors could perform bariatric surgery. According to bariatric surgeon Muffazal Lakdawala, Ahmed’s weight has now come down to 170 kg from a 498 kg. But the euphoria quickly subsided when Ahmed’s sister Shaimaa, on social media, alleged that Ahmed was not receiving proper treatment at the privately-owned hospital in Mumbai. She alleged that the doctors at Saifee, made “false claims” about Ahmed’s recovery and weight loss. The claim caused a stir among Egyptians as the local media published Shaimaa’s accusations along with Indian doctors’ comments, photos and videos, showing Ahmed’s weight loss.